In the current economic environment, businesses all over the world are finding it necessary to optimize the use of all resources in their control to boost productivity and gain a competitive edge in the global marketplace. 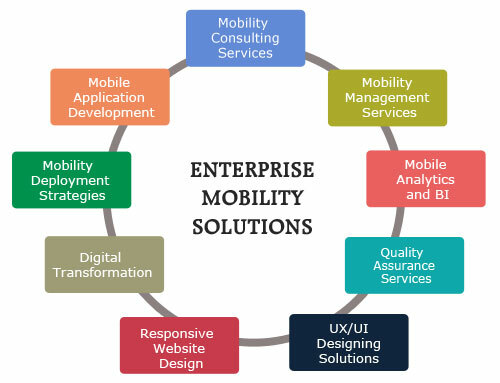 Enterprise Mobility Services are capable of providing organizations with such an edge in many ways. One of the key benefits is the ability to keep employees connected and productive, while on the move. A majority of today’s enterprise mobility suites are thus directed at ensuring that employees/field workers on-the-move remain connected to enterprise networks and have access to key organizational resources even from remote locations to ensure maximum employee productivity. On the move connectivity achieved through Enterprise Mobility Management ensures the availability of various resources such as customer information, inventory data, sales data etc. to field workers/traveling employees. A majority of the currently available solutions are designed to provide streamlined access to available resources among customers/clients, employees and the organization to maximize resource utilization irrespective of location. Enterprise Mobility Services allow organizations to interact more effectively with customers through various CRM applications and improved customer-company interaction. The improvement in customer-company interaction allows organizations to provide superior customer support. Visible improvements in customer support lead to reduce response times and generate superior customer satisfaction. Security is an essential aspect of any mobility solution deployed for enterprise use. Currently, developers are ensuring that organizational data is adequately protected by implementing various security solutions such as Digital Signature, Identify Provisioning and Encryption. Additionally, Enterprise Mobility Service is one of the best ways to secure mobile devices. Enterprise Mobility Services can significantly reduce enterprise-wide operating costs. The improvement in employee productivity provided through the solutions, facilitate optimal use of resources and people while minimizing wastage to facilitate a reduction in overall operating costs. An example of such solutions includes Document Management Solutions, which allow organizations to reduce the operating cost incurred by organizations for maintaining paper-based office systems while ensuring availability of key documents as and when required. Subsequent to the introduction of mobility solutions in an enterprise, average employee productivity of an organization increases significantly. As a result of the increased productivity, organizations are able to right-size their workforce and reduce overall personnel costs, while ensuring availability of sufficient manpower to carry out all business functions efficiently. An additional problem commonly encountered by organizations is the uncertainty faced by the management with regard to the capabilities and effectiveness of the solutions implemented. As the enterprise mobility market evolves, these as well as other problems would be resolved resulting in even greater acceptance of Enterprise Mobility Solutions by organizations all over the world.